Chutney and a good Red Leicester give these buttery biscuits a strong yet tangy taste. Tip the flour into a food processor with the butter and whizz for up to 1 minute until the mixture resembles fine breadcrumbs. (Alternatively, use your fingertips to rub the butter into the flour in a large bowl.) Stir in the cheese and 1-2 tablespoons of cold water, until the mixture combines to form a dough. Shape into a ball, wrap in clingfilm and chill in the fridge for at least 20 minutes. Preheat the oven to 200°C, gas mark 6. Line a baking sheet with baking parchment. Lightly dust a work surface with flour and roll out the pastry into a rough rectangle, about 20cm x 40cm and 5mm thickness. 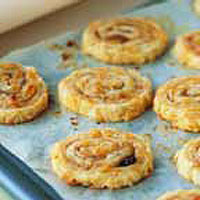 Using a knife or spatula, spread the chutney very thinly over the pastry. Roll up the pastry, starting from the longest edge, to form a log. Using a serrated knife, slice evenly into discs about 1cm thick and arrange on the baking sheet. Bake for 15-20 minutes until golden brown. Allow to cool slightly on a wire rack and serve either warm or cold. Cheese is much firmer and easier to grate if it is chilled. When the pastry's been rolled up to form a log, it can be chilled for up to two days in the fridge before baking. For a Mediterranean flavour, replace the Red Leicester and chutney with Parmigiano-Reggiano and 1 tablespoon of Waitrose Sundried Tomato and Olive Tapenade.